"Extremely well structured, planned and focused. Very useful and motivating!" Interested in one of our offerings? Specialised courses to suit your needs. We offer workforce development programmes and assist companies to advance their employees. Our psychological, cognitive and values / culture programmes are targeted at CEOs, managers or anyone else who may be interested to transform their thinking, interpersonal understanding and leadership effectiveness. 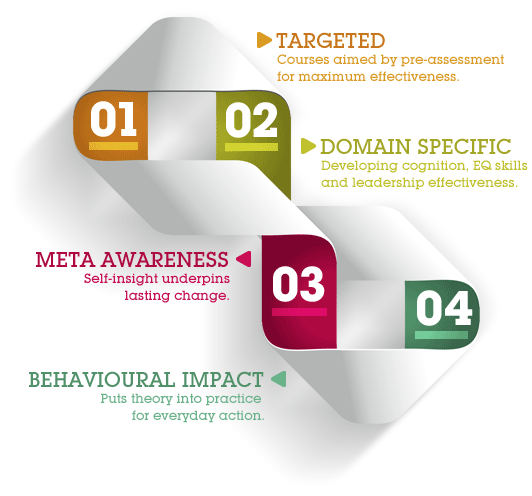 We aim at creating measurable change by targeting meta awareness - the linchpin of personal development and behavioural change. More about the courses on offer. Cognadev’s development programmes represent unique methodologies. Assessment results are used to inform the training requirements. The techniques used, capitalise on metacognitive criteria, self-generation, process-oriented-psychology, group dynamics, job-related content and behaviouristic principles. In addition to the usual benefits of training, including that of personal growth, enhanced motivation and the acquisition of certain skills, the development courses are unique in terms of their emphasis on a fit between individual and job requirements – thereby directly impacting on competence within the work environment and the transfer of newly acquired skills to everyday job functioning.